The Lope: Notes on the Origin of Jackalope Vampyre, or "Nosferatulope"
Notes on the Origin of Jackalope Vampyre, or "Nosferatulope"
I may have finally figured out how Nosferatulope (the vampire jackalope) came to be. 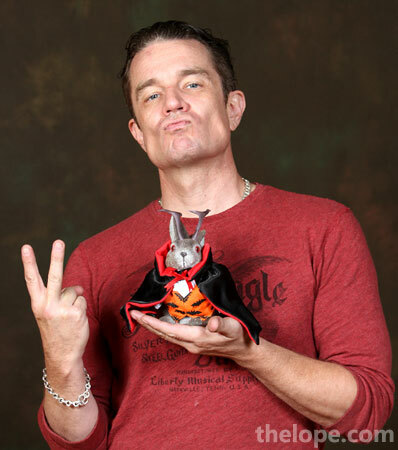 These archival photographs, taken at Tulsa's Trek Expo 2004, show actress Mercedes McNab, who played vampire babe Harmony Kendall on Buffy the Vampire Slayer and Angel, holding and kissing what appears to be an ordinary (eyes are normal) jackalope. 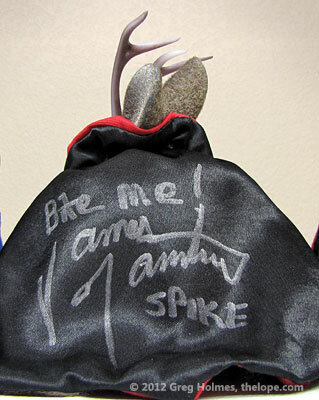 This may have been Ace wearing a vampire costume or another jackalope altogether. I don't know; I've never seen Ace and Nosferatulope in the same place at the same time. 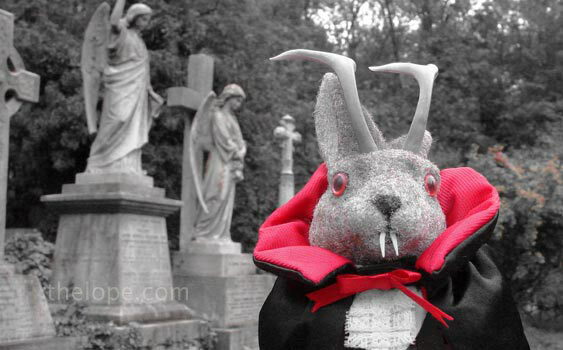 When seen in 2005-2008, as here in Dracula's London, "Nosferatulope" had red eyes. One theory on the full vampiric conversion, complete with eye color, is that a geeky blogger gouged the eyes out of a thrift store Easter Bunny and Frankensteined them into Nosfertulope to emulate Christopher Lee's red Dracula eyes. I prefer to believe the conversion to be the aftermath of a kiss from a hot vampire actress. Perhaps because of his possible Buffy and Angel related origins, Nosferatulope seems to have a thing for actors from those TV series. 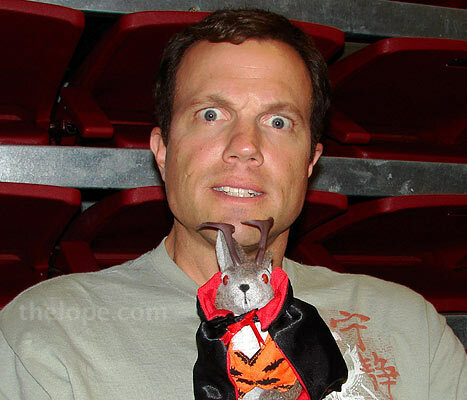 Here he is with Adam Baldwin, from the TV shows Angel and Firefly at Trek Expo 2008. Between mid-2008 and early 2012 there was a mysterious hiatus during which Nosferatulope was not seen. Various theories attempt to explain this, ranging from shame over the vampire name being associated with the Twilight books and movies to Nosferatulope being misplaced in my house. 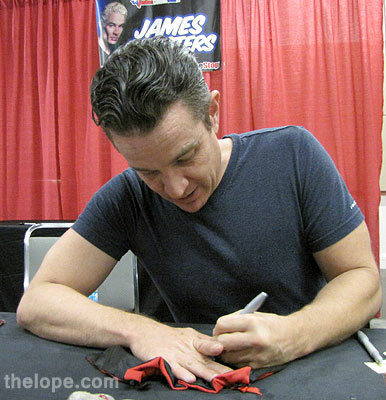 As Marsters signed Nosfertulope's cape, I asked the actor/writer/musician what he believes would have happened to the main characters of Angel after the series-ending cliffhanger in which they charged into battle toward an overwhelming hoard of every demon imaginable. Series creator Joss Whedon (later the director of The Avengers) followed up the Angel TV series with a comic book, but, disregarding the comic, I wondered what Marsters thought would have happened after the TV cliffhanger. Me: Did they live? Did they die? How did that turn out? Marsters: I'm a purist and I think they died. I think they died the honorable death. 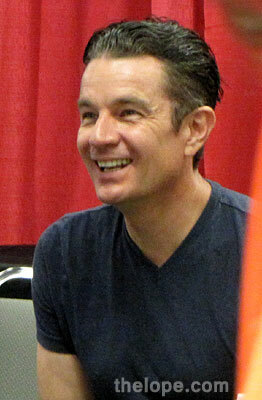 Marsters: So, there's no sequel.